Why Can't Humans Fly Like Birds? Surely, humans have tried to make this work. It seems like it could work. Unfortunately, I think we are doomed to remain as ground-based animals. Well, that is unless you count powered flight or gliding. We can do both of those. Now for my super short calculation hopefully to be followed by some useful data. 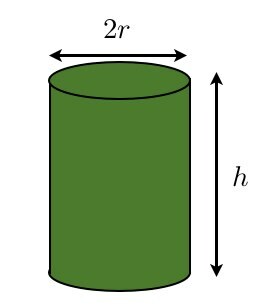 Let me represent the muscle of an animal as the following cylinder. Here, C is just some constant. But what matters more is the result. 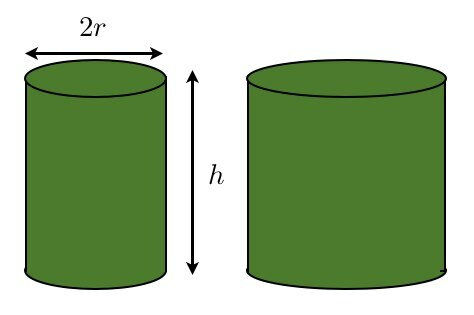 If I make an animal twice as tall and scale the rest of the dimensions proportionately, r would double and so would h. But the strength to weight ratio would be half as much as the smaller animal. Ok, well I can fix that. Let me double the mass (volume) but keep the same strength to weight ratio. I would need the same height, and the radius would have to be sqrt(2) times larger. Here is what that would look like. Perhaps you can start to see the problem. Even though this “muscle model” is completely made up, it still shows a problem. Bigger things get heavier way faster than they get stronger. This is also why my 8 year old daughter can do more pull ups than I can. She thinks she’s tough, but can she drive a car? No. Back to flying. I suspect that humans are at that size where it would just be super-awkward to have a body build suitable for flying. Perhaps this is also why you don’t see giant birds. How about I look at some birds that fly. You might also think of the giant flying dinosaurs (that aren’t actually dinosaurs) like the pterosaurs. 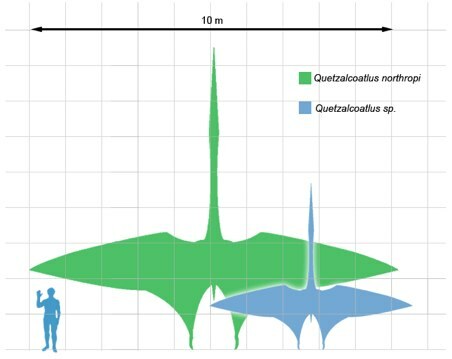 The largest of these was perhaps the quetzalcoatlus. According to Wikipedia, it seems the size is not universally agreed on. It perhaps had a 35 foot wingspan and a mass anywhere from 70 -200 kg (150 – 440 lbs). Did it actually fly? Who knows. Maybe it just glided. Maybe it was just big and didn’t fly. Perhaps we will never know for sure until will complete our time machine. Well, then what about a bird we know for sure can fly. A real bird that exists now. How about the Wandering Albatross? Well, at least it is the largest living flying bird according to Wikipedia. If it’s on Wikipedia, it has to be true, right? This bird has a wingspan of 3.7 meters and a mass of about 12 kg. Here is the plan. 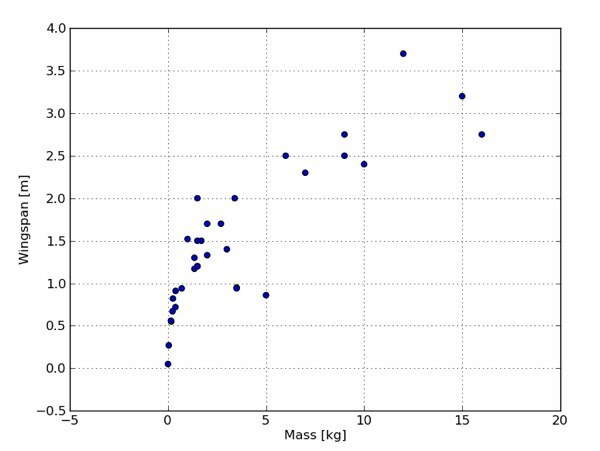 Let me look at a whole bunch of birds and see if there is a correlation between mass and wingspan. Here we go. Almost all of this data has been scraped from Wikipedia. I started with this page on Wikipedia and just followed links almost at random. Not all bird-wikipedia pages are alike. Some list wingspan, some don’t. Where w is the wingspan, m is the mass and C is some constant. This isn’t really what I would have expected, but I will run with it. In order to find the constant C, I will plot w2 vs. the mass. This should be a linear function and I can find the slope. Here is that plot. This fit gives a slope of 0.64 m2/kg and a intercept of 0.62 m2. It looks nice except it doesn’t seem to fit very well with the smaller mass birds. I could probably get a better function, but this will do for now. If a human was a bird, what kind of wingspan would this Big Bird have? Let me take a grown human male with a mass of 70 kg. 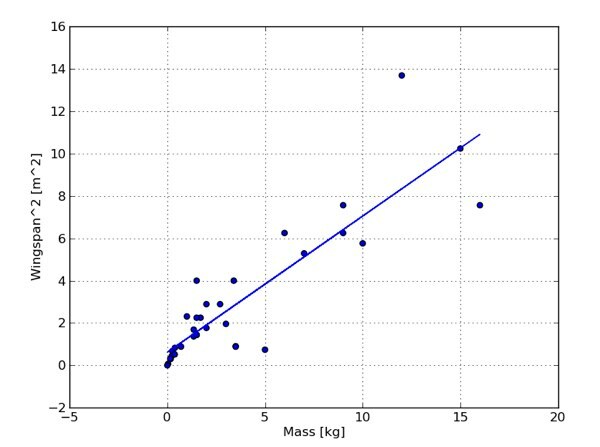 If I put 70 kg in for the mass in my function, I get a wingspan of 6.7 meters. Sure that is big, but possible. Right? Well, how much do you think 6.7 meter long wings would weigh? I doubt that wing mass is negligible. If I built them out of balsa wood, how much mass would it add? 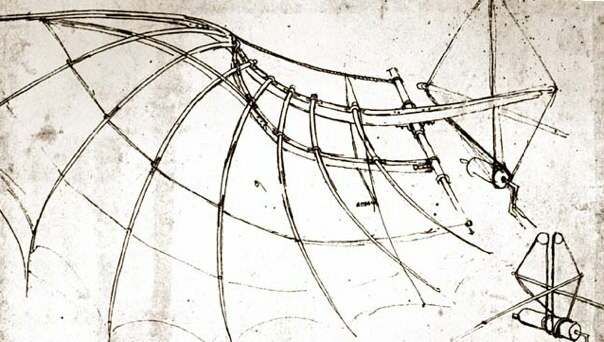 Lets just estimate an average wing thickness of 1 cm and a width of 2 meters. This would be a balsa-wood volume of 0.134 m3. Balsa wood has a density of about 160 kg/m3. This would give a wing-mass of 21 kg. AH HA. But now I need bigger wings. I could keep playing this game until I find wings that would work – but you see the problem. The problem is that if you have 7 meter long wings, you really aren’t going to be able to easily fit them in your car. And that is why humans can’t fly. Can Big Bird fly? I have never seen that. Perhaps his wings are too small. What would Big Bird look like with correct sized wings? First, need to guess his mass. This is tough since he isn’t really human. Let me ball park his mass at 90 kg (since Wikipedia lists his height at 2.49 meters). This would be a wingspan (if his mass included the wings) of 7.6 meters. Let me redraw Big Bird with wings this size. Talk about a BIG bird! What would Mr. Snuffleupagus say to those wings?